I don’t know about you, but every Christmas things get rather hectic around my home and I’m trying to think of unique, personalized gifts for our family members. When my daughter was younger I used to love whipping up a selection of new outfits for her dolls because I could always use fabric I had in my stash and they were so quick and easy to make up that I could make them either when she was at school or after she had gone to bed. And the best part was, they were ‘one of a kind’ and ‘made with love’ so they meant just that little bit more to both of us. Because I want you to experience the joy of giving something you made this Christmas I’m offering 20% off my How to Make Doll Clothes Video course so you can learn the easy way to make doll clothes for your loved ones. And with 20% off my Learn to Love your Serger (overlocker) online course you can finally gain the confidence to use your serger and create some awesome Christmas gifts. 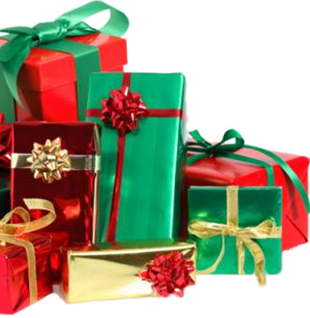 Or maybe you’d like to give the course as a gift, just let us know and we will get that organised for you. There’s 20% off all my doll clothes patterns too! That means you save 20% on all 18 inch American Girl size doll clothes patterns and you also get 20% off all 18 ½ inch Cabbage Patch doll clothes patterns. WooHoo!! You can give a complete wardrobe to your loved ones and save twice! Firstly, you will be saving because you made the outfit yourself and didn’t have to spend a fortune on brand name clothes, and secondly, you saved 20% on all your new doll clothes patterns! To get this great discount, simply enter coupon code: CHRISTMAS during checkout. Offer expires 25th December, 2018. 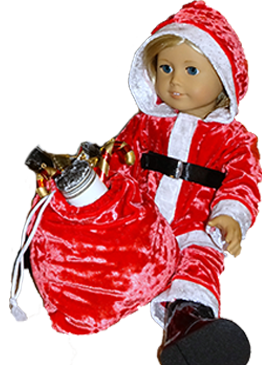 Oh, by the way, if you would like to have some fun and make this awesome Santa costume for your doll then check out my blog, American Girl Doll Clothes Patterns Santa Suit, and I’ll tell you how. It’s super easy and looks so cool!